Growing up I told everyone that would listen that I was never having kids. If I did I had already decided that I would adopt and then it would just be one. I grew up an only child, but my mother was the oldest of 12 so at all times one of my aunts, uncles or cousins was either living with us or at our house. It could be a little crazy. Then I met my husband and everything changed. I was overcome with this strange new emotion of wanting kids. Not just any kids, but our kids. It's funny how life can hit you without much warning. What I didn't expect at that time was that I would have two boys. I love my boys tremendously, but having two boys is more work than I ever expected. Right now they are at each others throats everyday, all day. This morning they had a big fight over magnets. While this might sound harmless I have boys so they aren't just verbal fights, they wrestle, shove etc. My oldest starts school next week and I am more than ready to going back to only having one child during the day. I think that I needed a better manual before having all boys, my house can be complete chaos. One of the few things that my two boys can agree on is seafood, they both love it. Today I tried a new recipe for Tuna, Cotija and Corn Tacos with Lime and Mango from the May 2013 issue of Martha Stewart Living Magazine. This recipe has 11 ingredients. It takes 25 minutes of total time, all of which is active and makes 12 tacos. I did make a few significant changes to the original recipe. First, the original recipe is vegetarian. With three males in my house they just wouldn't have gotten full with just corn and cheese. Therefore I used frozen tuna steaks, which I grilled and then sliced. Then I added the tuna to the tacos along with the rest of the recipe ingredients. I cooked my tortillas in a pan on my gas stove until they had grill marks. My cilantro went bad before I was able to make the recipe so I left it out. The fresh corn in this recipe was delicious. Without the tuna this dish would not have much protein. The addition of the tuna made the recipe for my family. Tuna steaks really are a great source of protein and they have great flavor in tacos. My boys were huge fans of the fresh mango, they ate a whole mango by themselves. If you aren't a fan of tuna, Mahi Mahi would work as well. The two photos (not of food) in this post are of the town that I live in Huntington, WV. 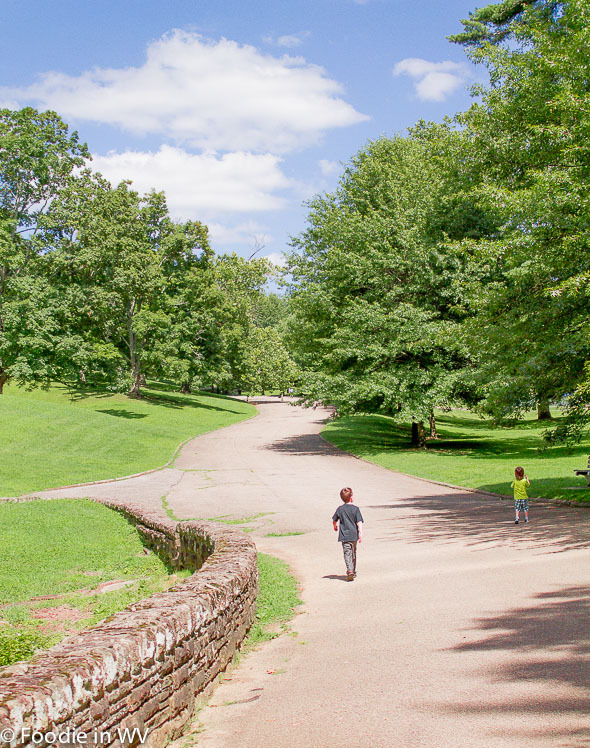 There are a number of large parks which my kids love spending time walking and playing in. For the recipe go to Cotija and Corn Tacos with Lime and Mango. A simple recipe for tacos using fresh corn and cotija cheese. Looks like my kind of recipe! I love lime and I have too many free mangos right now to deal with. I agree - guys just don't always buy that vegetarian entrée thing! Heading over to check out the recipe now. Your town is gorgeous. I love the pictures of the park, so big and airy. And your Tuna tacos sounds decadent! Can't wait to try them. Glad to know that someone else was like me growing up :) I wish that my boys would just fight and not wrestle, tackle etc. The town I live in is really pretty, it has a ton of very large parks which are great for kids! I love cotija, it's almost like feta but milder. I love the saltiness of it. I was pretty rough growing up too :) My male cousins always said that I was the mean one! I love the saltiness of cotija too, it's great in so many dishes! Fresh ingredients make the difference! Your tuna and tacos look scrumptious. I agree, fresh ingredients make the taste of a dish much, much better! The tacos looks delicious, I wouldn't have thought to add mangoes to them, but I'm sure it tastes great. 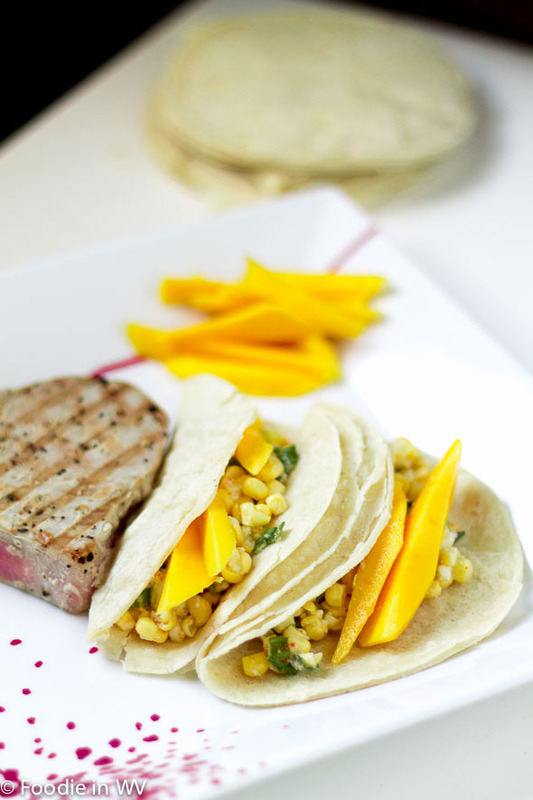 The mangoes really do add a nice sweet flavor to the tacos! Oh man, these sounds amazing. I love recipes like this. This looks so nice, Ann, and I love your additional photos! I can imagine it must be so hard having two boys, I know how my boy acts with his buddies, proper fighting and such. Sometimes it is just for fun, but it is still pretty stressful as they can be so rough with each other. My oldest kids do bicker, even though they are boy and girl - but the difference is my little boy gives in all of the time and lets my daughter get her own way! I don't think he would do that if she was a boy! They can be a lot of fun too, they are just both tired from being home with each other all summer :) My oldest starts school next week and things should calm back down! They are really easy to make, which is nice since I hate spending hours in the kitchen, especially in the summer. Love the non-food photos as well. Nice to get a glimpse into your town! I am pretty much the same way in regards to tacos :) Thanks for the sweet comment about the photos! Love tuna. Love corn. Now, my gal has gotten me into eating mangos lately so I think I would really like this! I used to hate mangoes when I was younger, but as I have gotten older I love them :) It's funny how food tastes change with age! I love how fresh this looks... though I would have to sub shrimp for the tuna :-) Great photo! My husband is in a tuna phase :) I am a bigger fan of shrimp also! 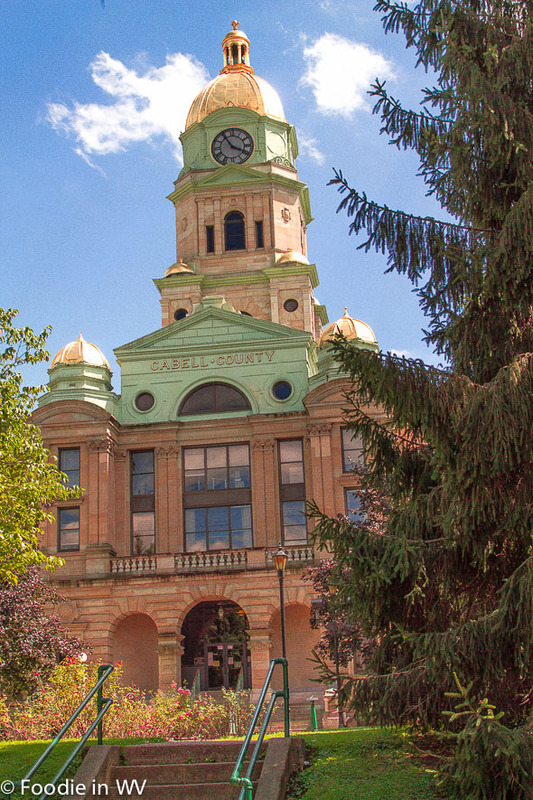 I love that courthouse! A beautiful building. Far from it :) I went to an arts school growing up and took photography in high-school, but I didn't touch a camera again until I started my blog. It has been a lot of trail and error! You're sweet though, thanks for the nice comments! It's funny how time can change opinions :) The mangoes really are great in the tacos, I would definitely try them in other taco recipes!